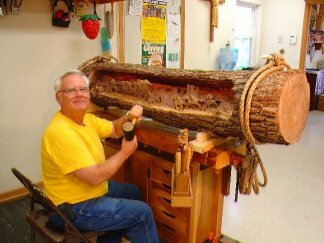 This 17-inch walnut log has been drying over 17 years, and is carved to a depth of 10-inches. To see the back of the carving, I needed to install a tube light inside the carving. The light looks like a sun rise. The scene on the mantel is from John Wayne's move Stagecoach. The mantel will be mounted by ropes tied to each end, and hung from the ceiling. The bark took over a quart of varnish for each coat. Finished weight is about 185 lbs. Design and carving time about 50 hours. This solid walnut mantel is carved to a depth of 7 inches. Length is 7 feet. Appearance of indentations is result of several photos being joined. Copyright © 2001-2007 The Carving Shop. All rights reserved.